Fusarium wilt (foo-zair-ee-um) is caused by the fungus Fusarium oxysporum f.sp. lycopersici. 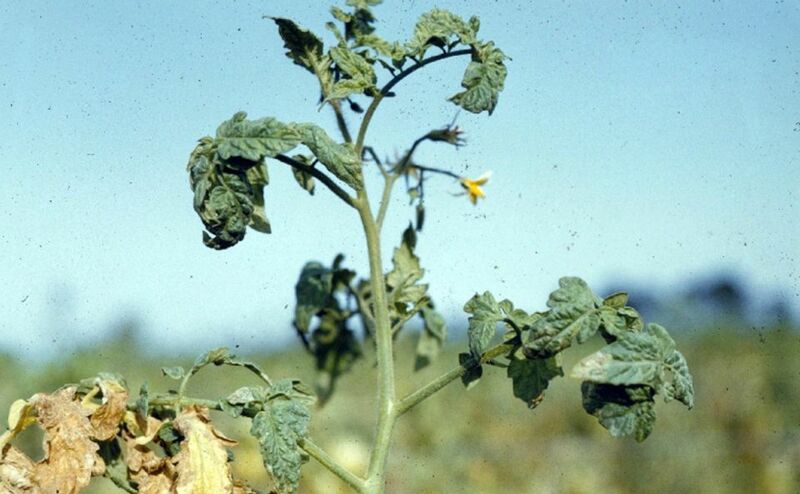 Fusarium wilt is found worldwide and even resistant tomato varieties may be affected. The fungus is soil-borne and makes its way into the plant through the roots. Once inside, it clogs and blocks the xylem, the tissue that moves water and some nutrients through the plant, preventing water from traveling up the stem and out into the branches and leaves. It may not kill your tomato plants, but they won't be very productive. Species of Fusarium can infect many plants including potatoes, peppers, eggplants, legumes, and bananas. Symptoms of Verticillium wilt can be very similar to Fusarium wilt. There are tomato varieties that are resistant to fusarium wilt, but if they are weakened by the root-knot nematode, they become more susceptible to it. Plants infected with Fusarium wilt will be stunted and the earlier they are infected, them more severe the stunting. Keep reading for more photos and descriptions of Fusarium Wilt symptoms and how to control it. Wilting The plants will literally wilt. Often it starts with a single leaf or shoot, near the top of the plant. It will recover at night when temperatures are cooler, but as it progresses, the entire plant will wilt and not recover. Watering does not make a difference. Yellowing Lower leaves will turn yellow, often starting on only one side. As with the wilting, the yellowing will gradually move up the plant. Dry Leaves The wilted leaves will dry out and fall off. Discolored Stem If you cut open the stem length-wise you will see dark brown streaks. There is no cure for Fusarium and since it persists in the soil for years, it can be very hard to eradicate. Here are some measures to help you control it. Resistant Varieties - If you've had problems with Fusarium wilt, you would be wise to stick with resistant varieties. Seed packets and many seedlings will be labeled with their resistance to various diseases. You could also consult a seed catalog for choices. Sterile Potting Soil - If you are starting your own seedlings, begin with a sterile soilless potting mix. Raise the Soil pH - Apply lime to the soil in your garden, to bring the pH up into the neutral range of about 6.5 - 7.0. Control Nematodes - Since root-knot nematodes can lessen resistance to Fusarium wilt, don't let nematode populations build up in your soil. Don't Cultivate - Avoid injuring plants' roots by not using a hoe or cultivator around your tomato plants. Damaged roots are entry points for the pathogen. Disinfect Tools - Clean all tools that may have come in contact with infected soil and make it a habit to regularly clean and disinfect your garden tools. Rotate Your Crops - Since the pathogen can persist in the soil for years, you will have to find another area to plant your tomatoes. A 5- to 7-year rotation is recommended, but that does not guarantee the pathogen will be entirely gone.